Lima is without a doubt the best place to shop for just about everything in Peru. It is home to Peru’s most famous and best designers, with their shops lining the streets of Miraflores and San Isidro. The nation’s capital also has Peru’s best and largest malls – one in particular has an unrivaled view – so when you find yourself in Lima, get ready to shop until you drop. 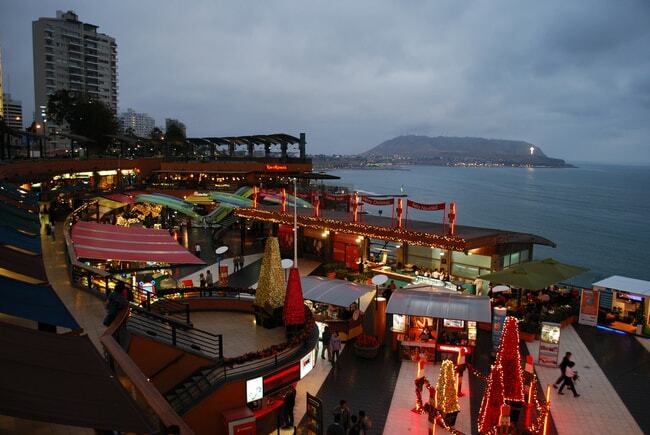 Larcomar might be the most beautifully located mall in the world. It is on the cliffside of the Miraflores boardwalk with a view of the Pacific Ocean and surfers catching the waves below. On a sunny day, you can’t find a better view in Lima. The mall is filled with European and American brands, and when you get hungry, the mall has some of Peru’s best and most well-known restaurants. When you’re shopping in Miraflores – and in Lima – you won’t find a shopping mall that has all the stores you’re looking for, but you’ll find streets that are mostly made up of boutique stores, and Avenida la Paz is one of those. Walk down the street and pop your head into all the shops that catch your eye. Jockey Plaza is Peru’s mega-shopping mall extraordinaire. It is one of Peru’s newest, so it is equipped with the best facilities and is similar in style to western mega-malls. You’ll find shops and boutiques offering everything from clothes and home appliances to boutique shoes and sports gear. This street in San Isidro is home to the best collection of boutique stores in all of Peru. It is lined with shops selling cutting-edge fashion using Peruvian materials and traditions. This renovated colonial mansion has it all, from quality handmade furniture to designer accessories and handcrafted pottery. Explore the entirety of the mansion, popping into all of the shops. If you get hungry, there’s food to be had and beers to be drunk in the back. Another boutique-lined street in San Isidro, this one is also filled with designer brands from Peru’s best up-and-coming designers. The boutique stores in San Isidro are expensive, so make sure to bring plenty of Peruvian soles for shopping. Most places will also accept American money. If you’re in the mood for Peruvian chains and a shopping center, it’s only a short walk away and makes for a perfect full day of shopping. Not exclusive by any stretch of the imagination, but certainly the best place to go if you’re looking for souvenirs, this building is lined with vendors selling Peruvian T-shirts, key chains, and all the alpaca gear you could ever want. It’s the perfect place to head before you leave Peru so that you can stock up on gifts for your friends and family back home.